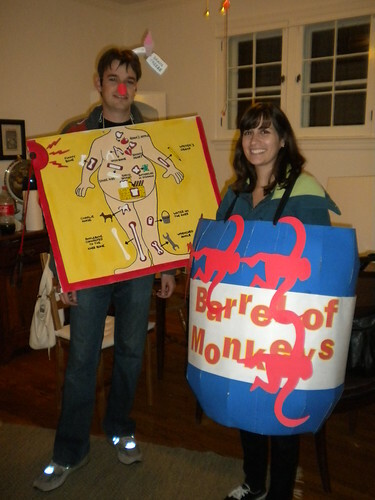 This year, Michael and I went as family fun games for Halloween. 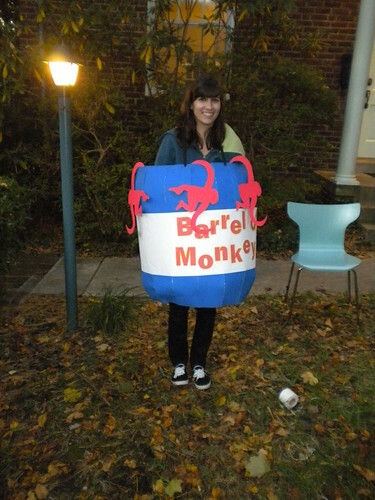 I was a Barrel of Monkeys, and Michael was Operation. Yeah, yeah, we're lame. But, what can I say, I love a holiday primed for craftiness. 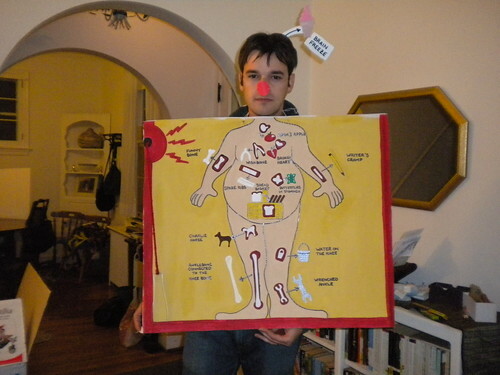 I made Michael's costume from a box that I simply painted to look like Operation. His "brain freeze" label was foam board attached to a head band. 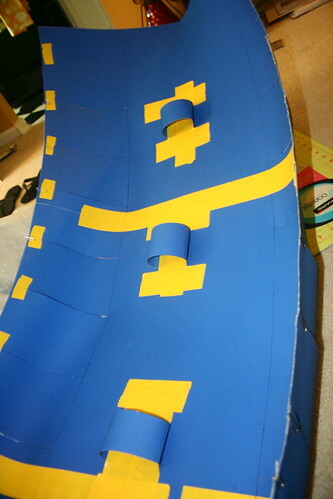 I made my costume from several sheets of poster board, pipe insulators, craft paper, glue, and lots of duct tape. 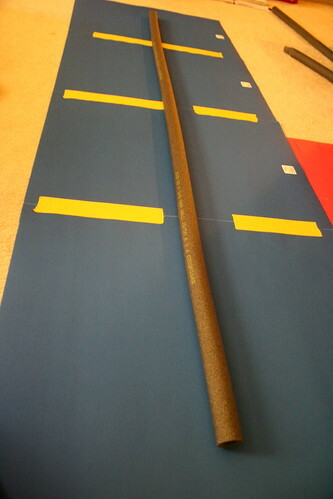 I made the circumference of the middle of my barrel the same length as the pipe insulator, so I glued and taped (for good measure) 4 pieces of poster board end to end. 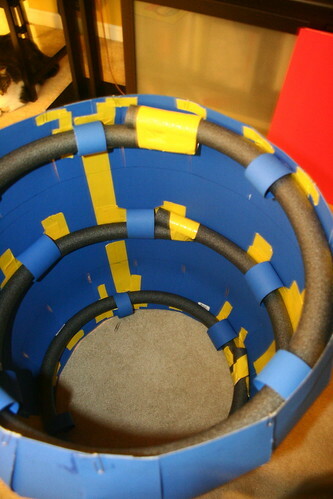 The pipe insulators will give the barrel structure. 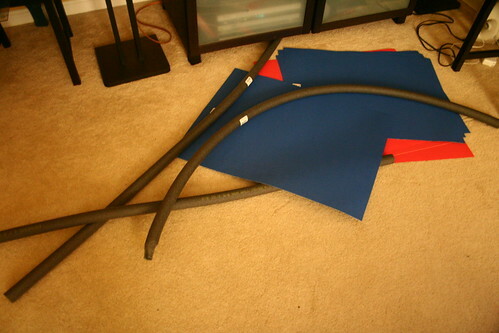 They're sort of like water noodles, and you can pick these up from home improvement stores for about $1 a piece. 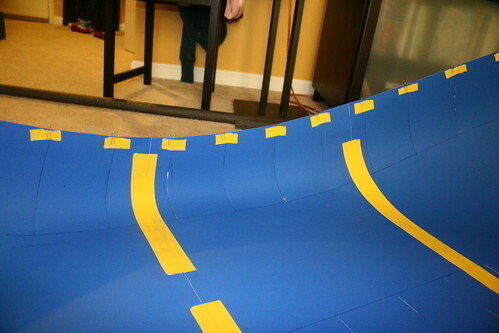 In order to taper the barrel off at both the top and bottom, I measured off at regular intervals at both the top and bottom of my poster board strip and cut along these lines, leaving the middle completely uncut. 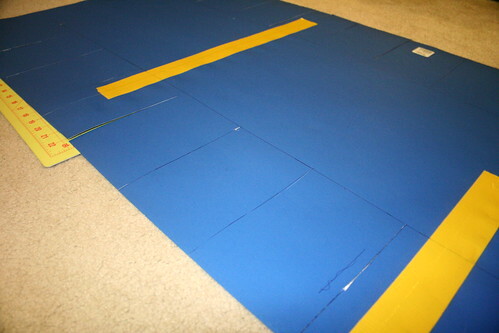 At each of these intervals, I overlapped the ends just slightly, glued and taped them, and then held each with a paperclip so that it'd all set. Once this was done, I created sort-of belt loops through which I could thread my pipe insulators. While we're on the subject of Halloween costumes, I just have to share our costumes from 2008 because, well, I'm still sort of obsessed with them. We went as lawn ornaments. 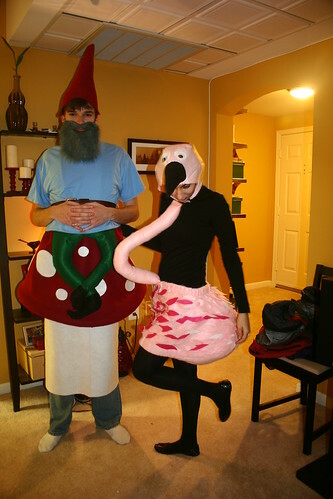 I was a flamingo, and Michael was a yard gnome. I put it all together with a bunch of felt, a pipe insulator, some stuffing, elastic, a t-shirt, a beard, and a little sewing and gluing. I laughed out loud with the 'Brain Freeze'...your genious ways make me happy..